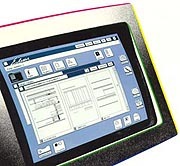 The Xerox 6085 running Viewpoint is the direct successor of the Xerox Star 8010. 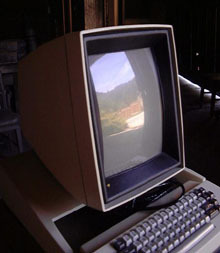 The DigiBarn museum has a special interest in the lineage of Xerox workstations but especially the Star - Viewpoint - Globalview series as these represented the most complete implementation of the "Desktop Metaphor" of any systems until the advent of mature Desktop graphical interfaces later on the Mac and PC/Unix/Linux in the 1990s. 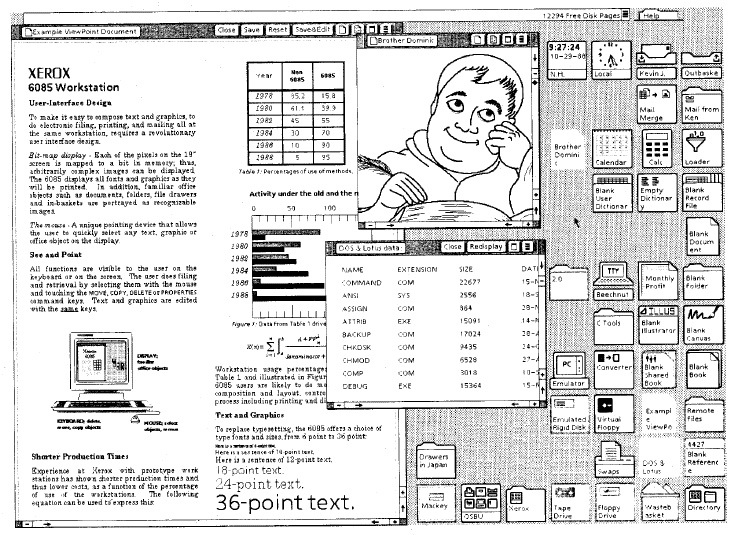 These systems were a full 15 years ahead of their time with sophisticated WYSIWYG document composition, built in Ethernet, email, scanning networked laser printing, development environments including Smalltalk, and much more. 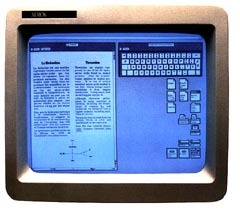 The Xerox workstations, while a commercial failure, occupy an important position in the lineage of visual computing systems. There is a lot packed into these "little brown boxes" and a big story behind them, which will be elaborated on this site in the future. 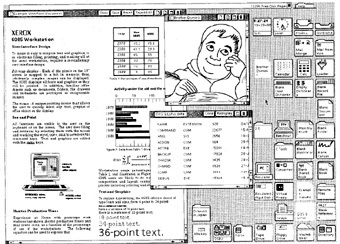 DigiBarn Museum Curator Bruce Damer's work on the Elixir Desktop was directly inspired and derivative of the graphical desktops you see here. Amazing: Xerox 6085 and 8000 series servers at work today (with 7650 scanners, 4045 printers) at Pathfinder Marine in Quebec, Canada today! See "Maze War" a multi player 3D game played in the 1970s at Xerox PARC and later on Xerox D-Machines networks (including the 6085), this could be one of the first "avatar" 3D environments. Dave Curbow's extensive Xerox Star Historical Documents. You have a text box with an unknown price for the 6085 in 1981. I don't know what the price was then but in 1987 they cost $15,000 each. This was the price for a 4Mram system with a 19 inch monitor. The disc drive size was 80Mbyte (40M & 110M were also available). It was my recollectionj that the 6085 had a minimum 2.4Mram configuration but that was pretty much useless under ViewPoint. Curator: Thanks Charles, correction made! Hello all, very interesting site. The next time I visit SF I'd like to come down for a visit. 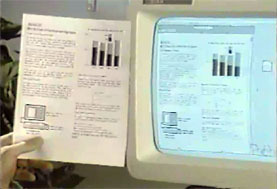 The Burlington Northern Railroad implemented the Xerox 6085 heavily in the late '80's to early '90's for MF emulation, word processing and email. They hired me from Digital Equipt. where I was a field service tech, mainly doing power supply adjustments and pm's on PDP 11/34's and 11/70's along with repair work on the Rainbow computers. BN had approximately 800 6085 workstations in Ft Worth and 2500 total across their system that I was one of the administrators for in Ft Worth, primarily hired when increasing the hard drives from 20Mb to 40Mb. Instead of buying the over-priced 40Mb drives from Xerox, we modified and implemented the ST251 ourselves and saved a ton of money. Recently we decided to locate some old parts and put together a little historical display on the various computer systems used at the railroad over the years, starting with the 6085. We found three towers, all documentation two monitors and one keyboard and one mouse, along with a documenter. Got something to tell us about the Xerox 6085? Contact us!